For information on pricing and availability or to schedule a tour of the hall, please contact Hall Chairman Ed Lenart PGK at 732-636-2700. 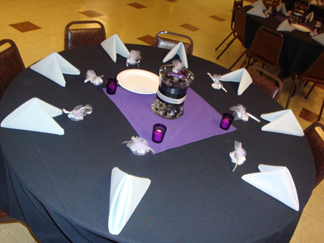 (15 round tables with 8 people per table). The hall has a dedicated bar facility and a coat room. Catering is provided by D'Aprile Catering (Sewaren, NJ). 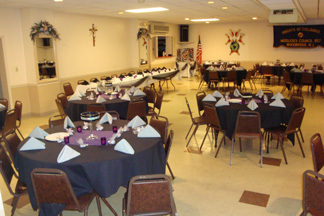 The Knights of Columbus, council #857 is located at 130 Main Street, Woodbridge, NJ 07095 (corner of Main Street & Route 35 "Amboy Avenue" in the heart of Woodbridge). From Route 9 North: Take Route 9 North to the Main Street exit (just past the Hess Gas Station). At light, make right onto Main Street and travel about 1 mile. The Knights of Columbus hall is located on the left at the intersection of Main Street and Route 35 (Amboy Avenue). From Garden State Parkway South: Take the GSP South to Exit 129 (Route 1 North). Take route 1 North until you merge with route 9. Continue north about 1 mile until you reach the "Amboy Avenue" exit (just past the "Animals & Things" store). Take route 35 south for about 1-1/2 miles. 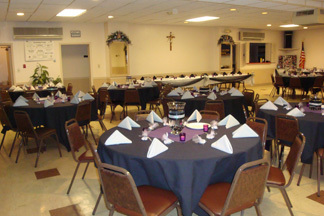 The Knights of Columbus hall is located on the right at the intersection of Route 35 (Amboy Avenue) and Main Street (across the street from the Reo Diner). From Rahway or Carteret: Take Rahway Avenue into downtown Woodbridge. Rahway Avenue turns into Main Street in Woodbridge. Follow Main Street through downtown Woodbridge. The Knights of Columbus will be located on the right side, just past the intersection of Main Street and Amboy Avenue.